"Serving individuals with aphasia and their families is an honor that we share with the community providers," says TAP Founder, Maura Silverman. "Speech Language Pathologists and other rehabilitation specialists are integral in our comprehensive programming, and we couldn't do it without their collaboration and enthusiasm for our shared work." Individuals with aphasia – They receive support and programming for as long as they desire it. Individuals learn to improve language skills in meaningful ways. Family and friends of those with aphasia – They can take part in programming to learn to communicate more effectively with those who have aphasia. 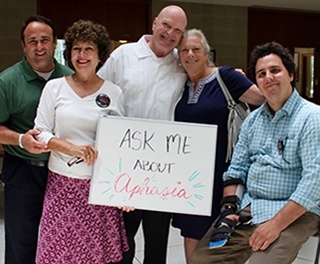 Community – Healthcare providers (hospitals, medical centers, rehabilitation programs) and businesses can receive training and education to increase access to aphasia services in their communities. Aphasia Group – a one-hour session where six to ten participants with aphasia can practice language and speech skills; groups are facilitated by an SLP and trained volunteers. Aphasia Day – a four-hour weekly group that engages in music therapy and language skill practice via breakout sessions on writing, reading, technology, and other tasks. Book Clubs – several clubs that read a book over several weeks, covering about 30 to 60 pages each week. Discussions revolve around understanding content, ideas, and characters; book club groups are lively and fun. Outspoken Group – high-level group that addresses conversational skills. Challenge Group – a group for those with recent stroke or brain injury who thrive in a program of multimodal language stimulation; members are committed to doing work outside of the intense, yet encouraging program. Group meets for 90 minutes once a week. Back To Work Group – a group that supports individuals and their pursuits by helping them to reacquire the language abilities necessary for job performance (conference/phone calls, emails, reports, and presentations). PPA Programming – a group that works collaboratively with programs around the Triangle to serve the needs of those with primary progressive aphasia (PPA) and their families. This includes groups, training, and conferences. TAP Garden Club (also known as TAProots) – this group volunteers at the Holly Spring Food Cupboard and help to grow over 1 ton of fresh produce for people in need. All skill levels of gardening welcome. 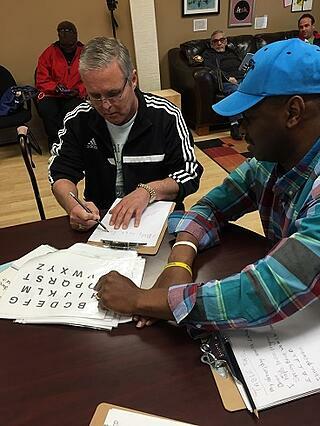 TAP Writing Group – a group that targets common errors in writing for people who have aphasia. Members play writing games, do functional writing tasks, and practice writing strategies; all ability levels are welcome. TAP Into Technology – group members bring their electronic devices to this session and look to use technology to enhance communicative efforts, enable self-directed language workouts, and connect to the world at large. TAP also offers a Children’s Program that trains kids (or grandchildren) of individuals with aphasia to understand aphasia and communicate better with their loved ones. The project developed a 20-minute fairy tale about aphasia and hope to get this “published” to allow a source of revenue for TAP. The newest grant-funded program, called AphasiaConnects, pairs individuals with aphasia with Read and Feed, Inc. Tutors to provide summer learning, reading, and educational enhancement for at-risk children. TAP clients provide food and tutoring weekly throughout the summer in this unique program. For more information on TAP, please visit www.aphasiaproject.org or email info@aphasiaproject.org.